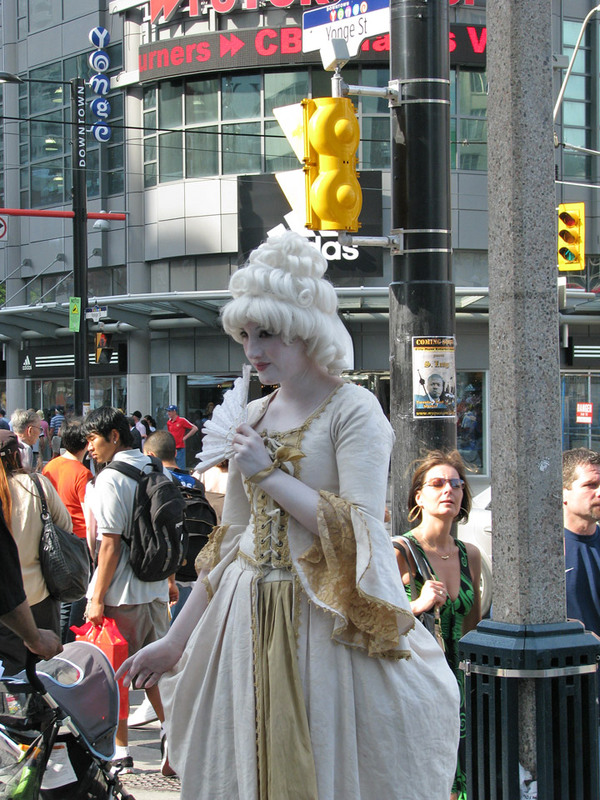 Yonge-Dundas Square (commonly called Dundas Square) is a public square in downtown Toronto, Ontario, Canada. 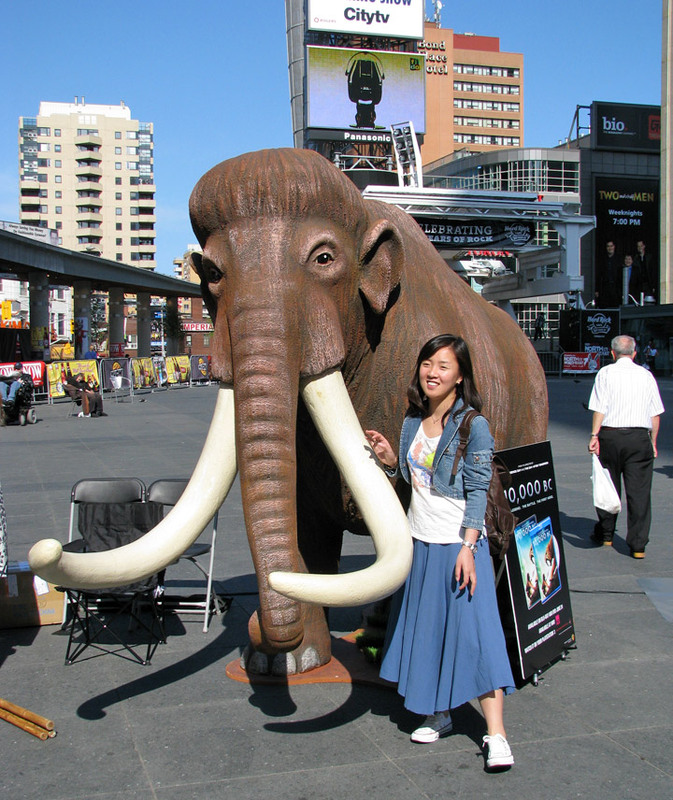 It is located on the southeast corner of Yonge Street and Dundas Street. It was opened to the public in November 2002, and a "grand opening" concert was held on May 30, 2003. 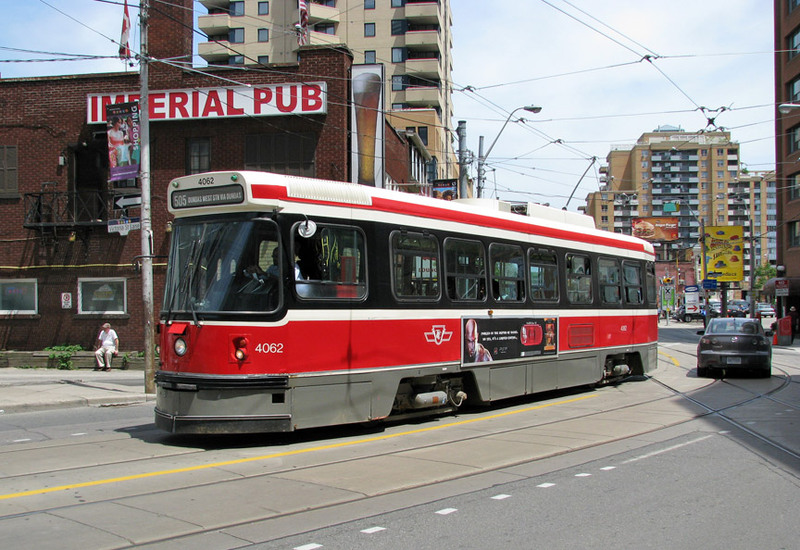 Because Dundas Street bends at the square, a triangular portion is chopped off one side, so the shape of the square is actually like a square with a triangle taken out of one side. This northern side of the square that runs at an angle is known as the hypotenuse, which features a structure supported by 11 concrete pillars of the type used to make overpasses on highways. This creates an industrial urban aesthetic, which, being to the north, casts no shadows on the rest of the space. The other three sides are square (i.e., at right angles to one another and to Yonge Street and Dundas Street West). Designed by Brown + Storey Architects, the square was intended as a new public space in Toronto, somewhat akin to Nathan Phillips Square, designed by Viljo Revell for New City Hall. 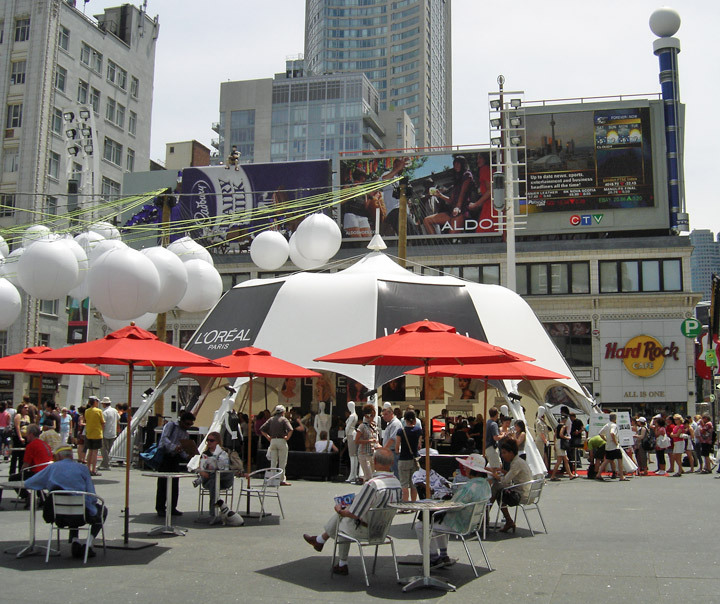 Unlike Nathan Phillips Square, however, Yonge-Dundas Square is operated as a commercial venture, with a separate Board of Management. 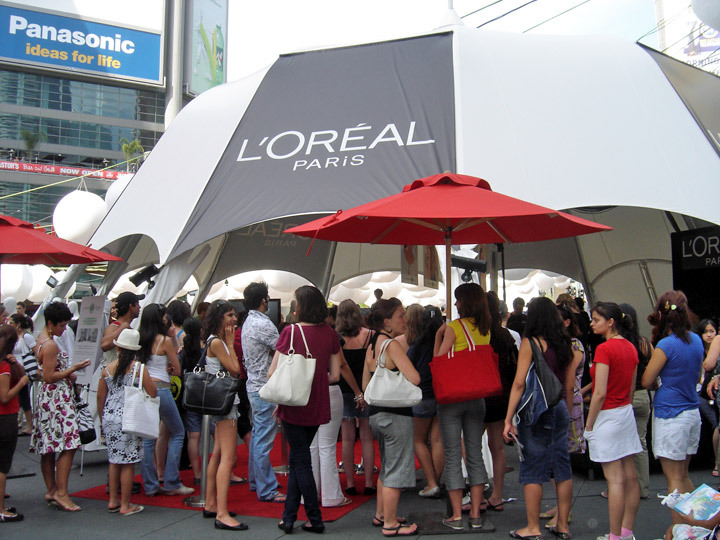 Until the late 1990s, the Yonge-Dundas Square site was occupied by a block of retail stores, and considered by many to be a "seedy" or dangerous corner. 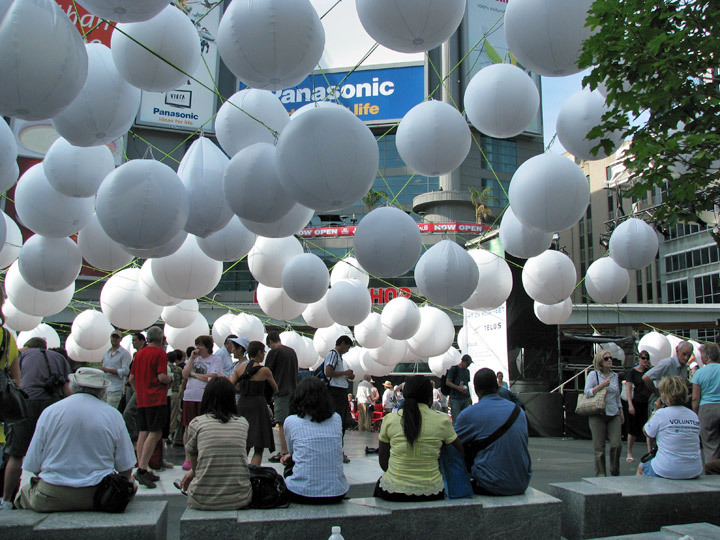 In 1998, as part of its Yonge Street Regeneration Project, Toronto City Council approved the expropriation and demolition of the buildings on the site, and the construction of Dundas Square. The square is opposite the Toronto Eaton Centre and just south of the Ryerson University campus, and is part of a historic revitalization effort by the city, residents and the Downtown Yonge Business Improvement Area, an association of local businesses. This effort was spearheaded by Councillor Kyle Rae, Mr. Robert Sniderman of the Senator Restaurant and Mr. Arron Barberian of Barberian's Steak House. 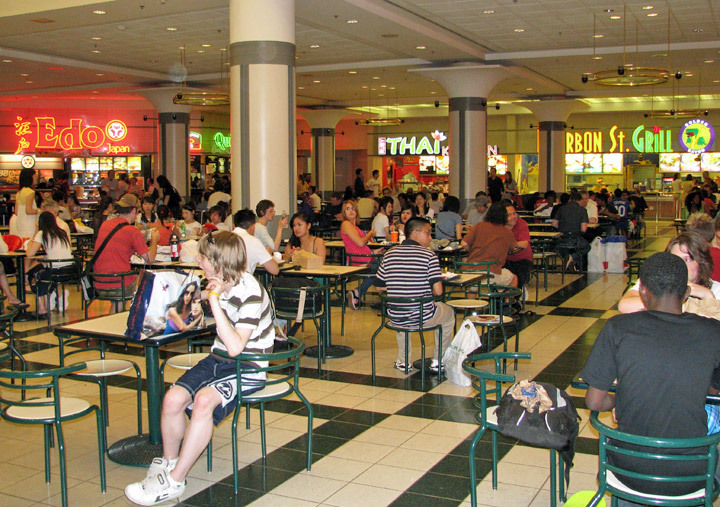 In late 2007, the Toronto Life Square entertainment complex opened across the street from the square. The square is actually on a slight incline, which architects Brown and Storey have said was intended to evoke a theatrical stage. It is made with modular raised square textured 35.125 by 35.125 inch (892 by 892 mm) granite slabs (each slab costing approx. 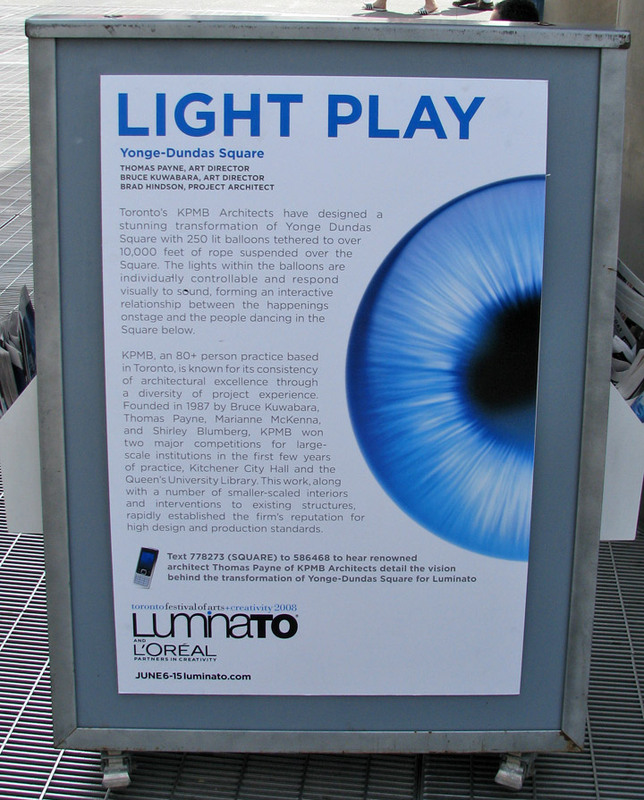 $1500: $1,000 materials plus $500 labor), features a diagonally running zinc canopy along the northern hypotenuse of the "square", a movable plinth which serves as a stage for concerts and other performances, a row of lighted fountains set directly into the pavement, a row of small trees along the southern edge, a transparent canopy over the plinth, and a new entrance to Dundas subway station below. A series of low, circular stone planters was added to the western side of the square in summer 2005. The granite slabs, made of two kinds of granite, modularize the space, with a period of seven slabs (every seventh slab has a slightly different texture and darkness). This period intertwines with the five-slab periodicity of the splash fountains, with a spatial period of 177 inches (4.5 m) (one splash fountain every five slabs), making a mathematically intricate space. The centerpiece of the square is the array of fountains designed by Dan Euser of Waterarchitecture. Two rows of ten fountains are spread out across the main walkway of the square, so that visitors have the opportunity to walk through or around the fountains. Unlike many other city fountains, the Dundas Square fountains were meant for waterplay, and include a sophisticated filtration system that, according to both of the architects, keeps the water at or above "pool quality" water. According to Euser, the water is treated to maintain health standards for water play. According to facility administrator Christine MacLean, the slate that was chosen for the entire space has nonslip properties for the safety of persons running through or playing in the fountains. Each of the ten water fountains consists of a stainless steel grille with 30 ground nozzles (arranged in three rows of ten) under it. 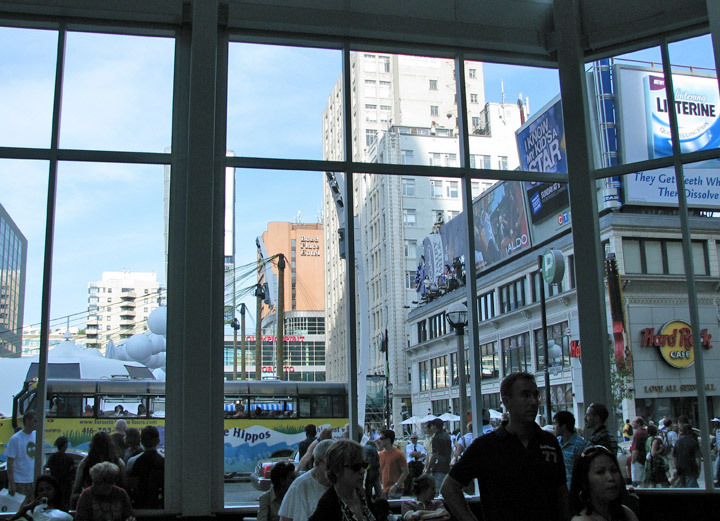 As well, there is a road which traverses the square known as Dundas Square. 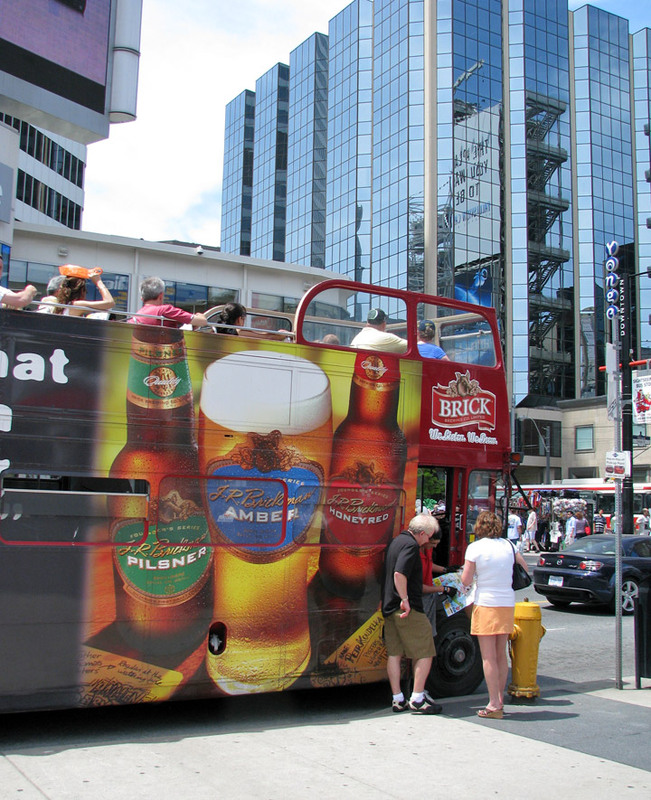 This is a small street leading from Yonge St. to Dundas St.
Yonge-Dundas Square is located within the Downtown Yonge Business Improvement Area (BIA). City of Toronto councillor Kyle Rae has pointed to Times Square in New York City as a model to emulate, with its canyon of billboards and animated advertising screens. 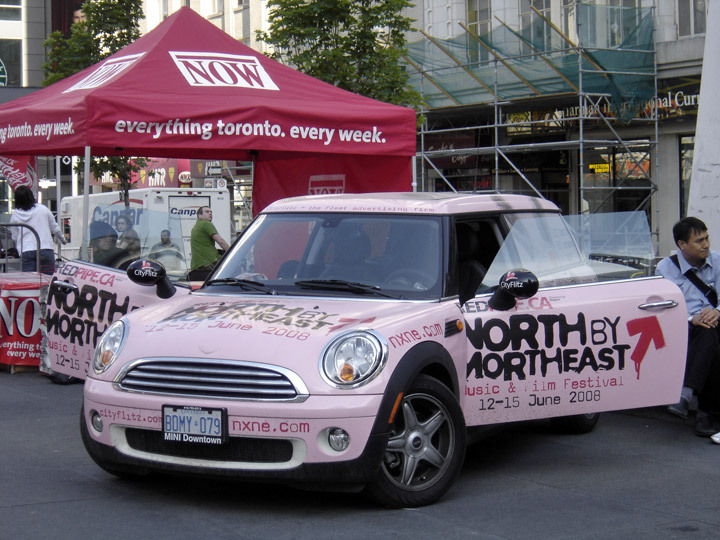 Other projects in the immediate area include the redevelopment of the Eaton Centre, the construction of a new retail and cinema complex to the north, called Toronto Life Square (and formerly known as "Metropolis"), and the construction of 35 Dundas Street East to the south-east (on the corner of Victoria and Dundas), formerly the home of Olympic Spirit Toronto. On October 22, 2007, Rogers Media announced that it will buy this building as a new home for its Citytv and OMNI Television stations. 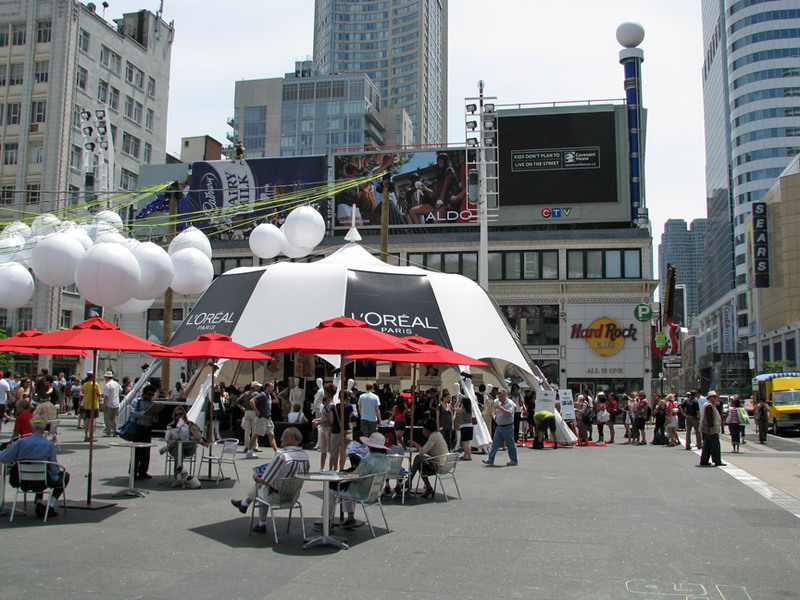 A "Media Tower" - essentially a scaffold for billboards, operated by Clear Channel Communications - has been constructed on the north-west corner of Yonge and Dundas. It is considered to be the tallest media tower in the world. Another large media tower complete with video screen is a major feature of the building on the south-east corner of Dundas Square. 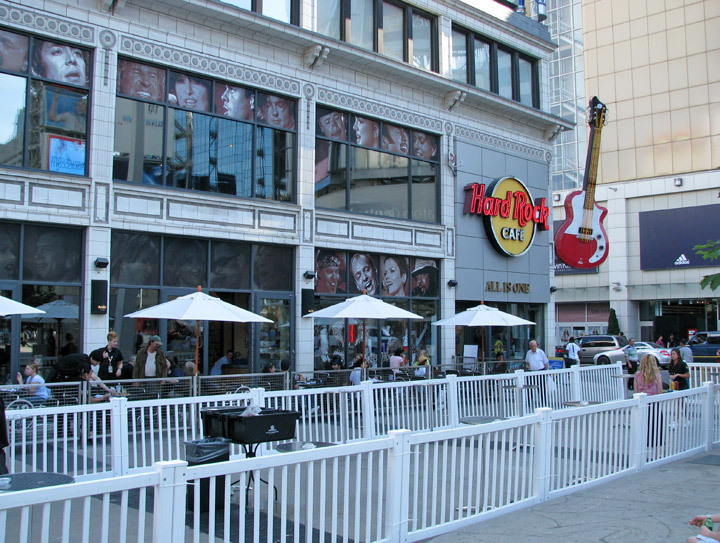 And the building which is home to the Hard Rock Cafe on the south-west corner of the square also features a series of billboards and a large video screen. The introduction of these imposing media towers and their brightly illuminated advertising billboards has been too great a sacrifice for some area residents, who feel a loss of the neighborhood's identity and character. 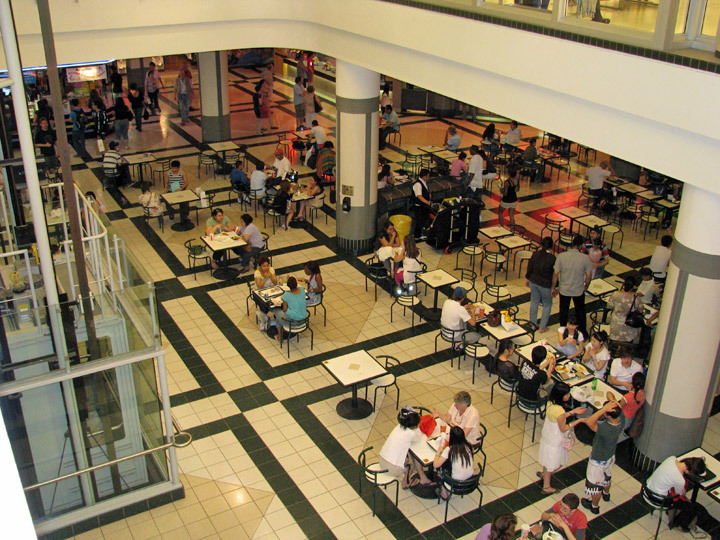 The redevelopment of the Eaton Centre and the building at Victoria and Dundas were both completed in 2004. Toronto Life Square (formerly known as the Metropolis development), began in January 1999 after the City of Toronto expropriated a number of properties. Following a number of delays (including some construction shutdowns) the project is nearing completion and the developer, PenEquity Management Corp., currently plans a Phase I opening in 2007. Architectural glass brick is used to obscure clear visual line of sight into women's washroom/changeroom on the left, and men's on the right. The glass brick, however, admits light, and the labyrinth design allows for unobstructed passage of air, as well as barrier-free accessibility. Additionally, inside the washrooms, glass brick windows run around the entire perimeter, near the top of the wall, to create "natural artificial light" by way of light bulbs shining in, but located in the service/utilities area that runs all the way around outside the washrooms. The result is an underground space that is transformed into a space that appears to be naturally illuminated. 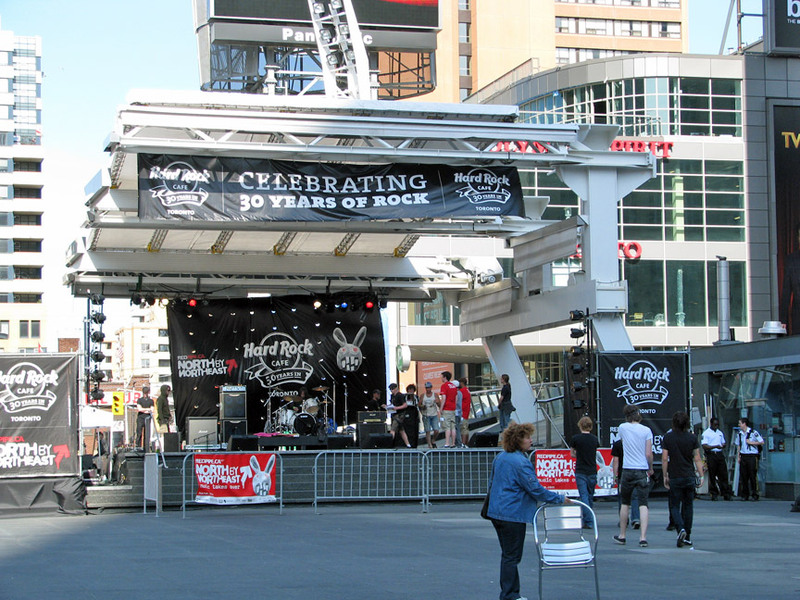 The surface of Yonge-Dundas Square is not level, because it is sloped upward as the surface goes away from Yonge Street. This is to allow sufficient height to provide clearance for the Toronto Parking Authority garage entrance. The architects planned the surface's slope to make it interesting and to accommodate the necessary clearances for what lies under the Square. Additionally, level P1 houses the washrooms/changerooms, green room (for stage performers), and various utilities rooms, custodial and supply closets, as well as the water treatment plant and pump rooms for the fountains. 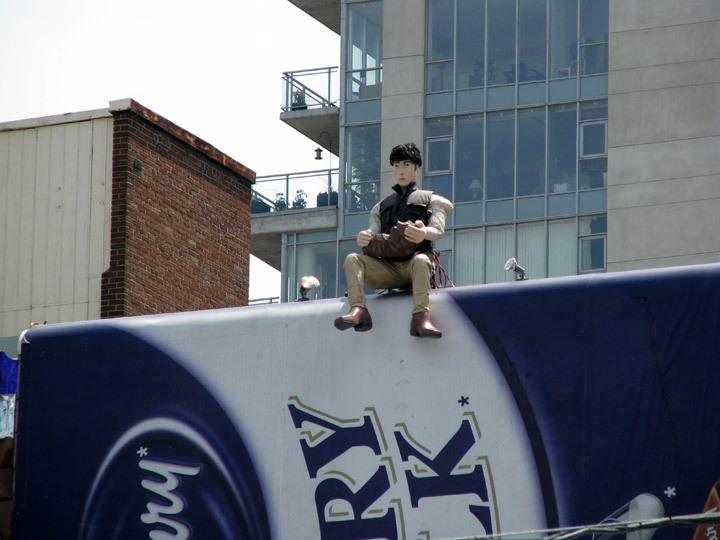 Yonge-Dundas Square is controversial in some circles. 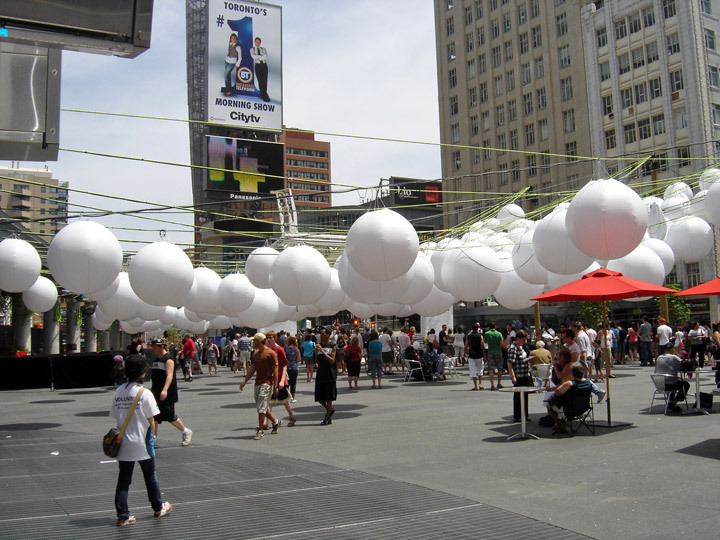 Criticism ranges from suggestions that the city has missed an opportunity for more green space within the downtown core (or that they have missed an opportunity for what some critics consider more interesting architectural elements) to questions of what the true intent behind the ostensibly public square is. 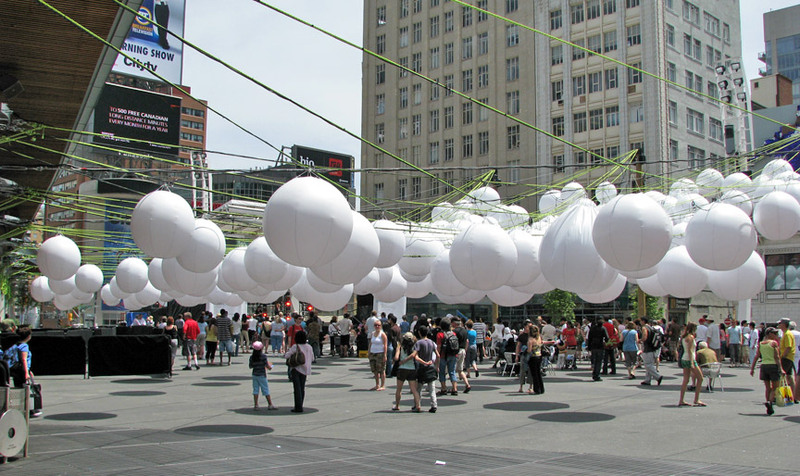 A number of groups, from the Toronto Public Space Committee, to organizers of Toronto iterations of the Reclaim The Streets phenomenon, often point to the Square as exemplifying what they consider a negative trend in urban planning. The square is surrounded on all sides by gigantic commercial billboards; with city funds going towards what appears to be a large re-development experiment, many have pointed to the square as a prime example of the creeping privatization of public space. Those making this point have been bolstered by the fact that the square's board is populated by both local businesses and residents. The Board of Management for the Square is an ABC organization of the City of Toronto. While there are permit fees for commercial events, community groups can use the Square for free under the Square's Community Use Policy. All events are charged back for staffing and equipment use. On an aesthetic note, some detractors have said that when the fountains are not running (e.g., to mask out the sounds of traffic), the square feels like a GO transit commuter bus station or an abandoned parking lot. Some suggest it should have monuments or other items (such as greenery) to break up the open space. However, the main problem is often said to be the simple lack of people. This has been improving with the addition of regular special events including lunchtime jazz concerts and outdoor film screenings. 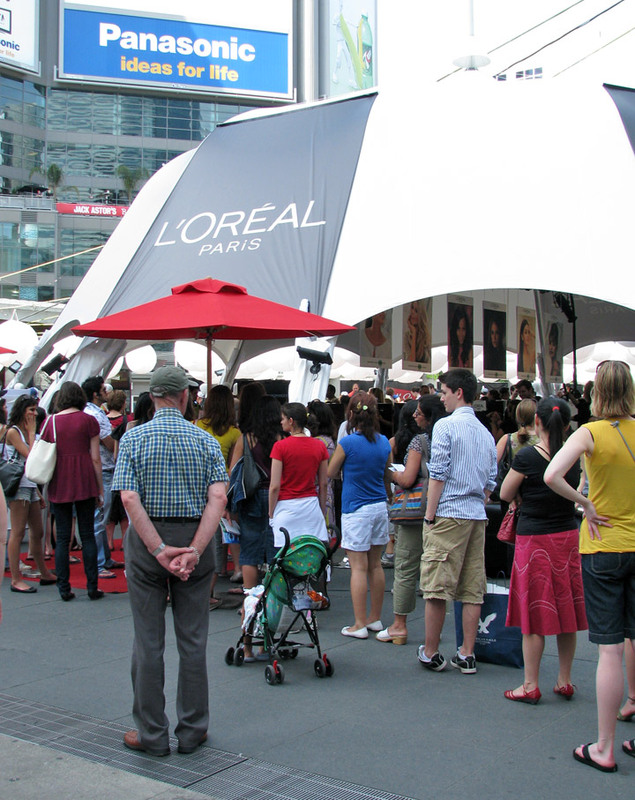 When events are not taking place, the Square is set with cafe tables, chairs and umbrellas. 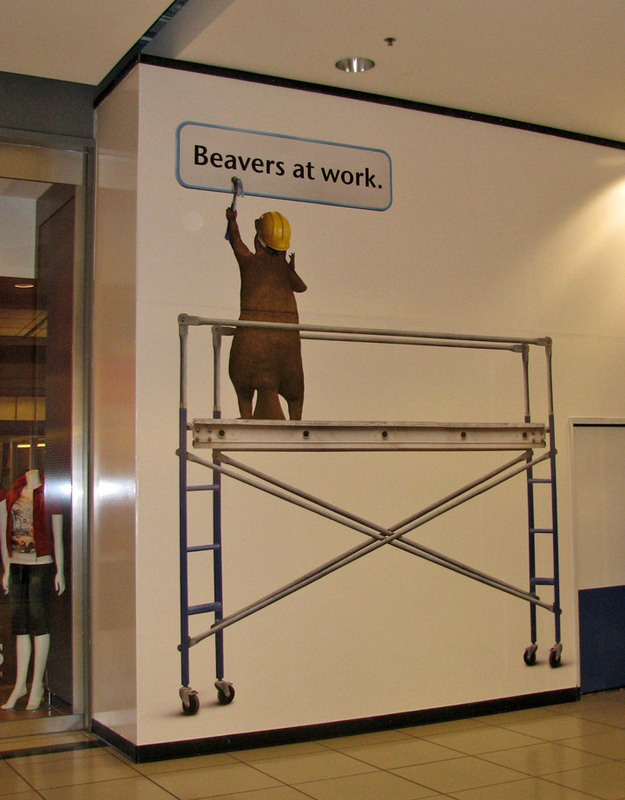 On March 15, 2006 sections of the signage on the Eaton Centre side of the square came loose falling onto pedestrians. 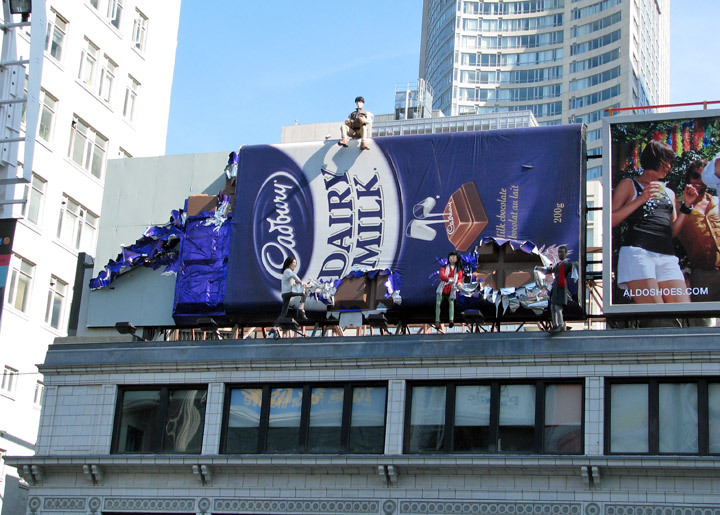 High winds reaching speeds of 120 km/h (75 mph) caused sections of the billboard to fall more than fifteen stories to the ground. Police closed Yonge Street until the signage could be secured. One man in his 20s suffered severe head injuries from the falling debris. One of the three rows of ten nozzles that are present in each of the 20 fountains. A fisheye lens was used so that we can see at least some of the nozzles in close detail, yet still be able to see and count all 10 of them. The nozzles are spaced 2 inches (approx. 50 mm) apart within each row, and the rows are spaced 3 inches (approx. 75 mm) apart. The width of the water spray is always 6 inches (152 mm) wide, the three rows of ten are each 3 inches (76 mm) apart, and 18 inches (457 mm) broadside, because the nozzles in each row are spaced 2 inches (51 mm) apart. This 18 inch (457 mm) width was selected to match the width of the widest of adult human users. The height of the spray is time-varying, and under program control. There are various programs for the fountains, the two most common being sinusoidal unison, and westward wave packets. During most of the summer and fall of 2004, all 600 nozzles rose and fell in unison, in a sinusoidally time-varying fashion, with a period of approximately 10 seconds, to create an urban beach effect, as the "waves" or "surf" pounds against the hard rock surface. The water goes from approximately 1 foot (300 mm) high, to 8 feet (2.4 m) high, giving rise to a peak-to-peak sinusoidal amplitude of 7 feet (2.1 m). Starting on Thursday, 27 October 2004, the program was changed to one that sends wave packets westward, with a period of approximately 8 seconds across all 10 fountains (but only the middle channel of each one, with the westward channels forming a background pedestal). This period gives rise to a phase velocity of approximately 5.6 meters per second. Running westward at a moderate speed (i.e. approximately 20 km/h), one can stay inside the peak of the wave packet, to get a very enjoyable waterplay experience, when the wave packet program is running in the fountains. Meanwhile, nearer Yonge Street, by the splash pad (a series of fountains designed to allow people to cool off in their spray), a group of men in their early 20s laughing and speaking Portuguese tried to wrestle each other into the spray. 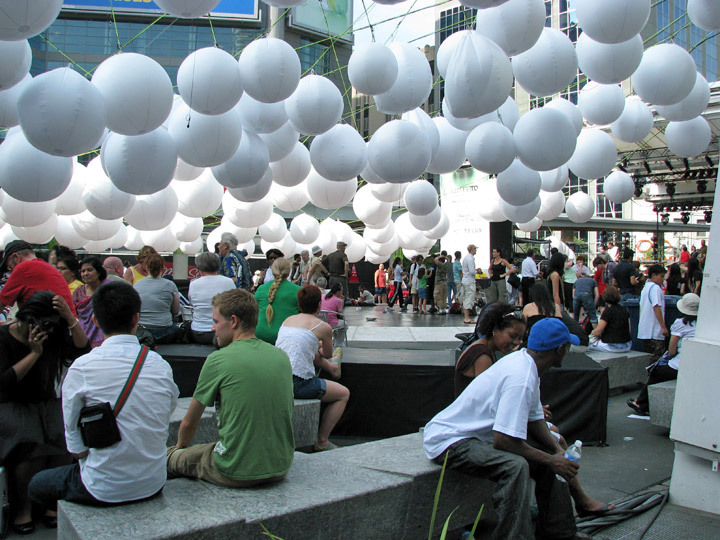 Architects Brown and Storey, the creator of the fountains (Dan Euser), the firm that initiated the bidding, Councillor Kyle Rae, and the management of Dundas Square have all confirmed that waterplay was one of the intended uses of the space. The entire rock surface is of a very dark (almost black) color, and effectively absorbs sunlight, thus creating a warm surface to rest on. The water runs under the dark rock slabs, and is thus heated by them, so that the fountain water is solar heated. Three curved lighting masts along the south edge of the urbeach, made of hollow structural steel have a high gloss white finish that contrasts with the rough nonslip texture of the black granite, and each support six mercury vapor arc lamps that create evening light that comes from approximately the same directions as natural sunlight does during the day (i.e. from various southerly directions). At the Southeast and Southwest corners of Yonge-Dundas Square there are drinking water fountains. The water fountain on the Southwest corner (nearest to Yonge Street) is known for its large, cool stream of water that flows down the fountain to drains in the ground. The stream produced by the other fountain is warmer and flows less copiously. On the other hand, the fountain nearest Yonge street is also near a protrusion in the ground that people like to sit on. This makes it very awkward to get a drink out of this fountain since often a person is sitting right in front of where one would get a drink. This is especially awkward since the stream produced by this fountain is big, making getting a drink a cool, refreshing experience, but also resulting in somewhat of a messy experience that one would not want a stranger to view.